We are pleased to introduce Stephanie Kerns, Director of the Biomedical Libraries. Stephanie joined us last month, on May 15, coming from the Oregon Health and Science University Library in Portland, Oregon where she held the position of Assistant University Librarian for Information and Research Services since 2013. 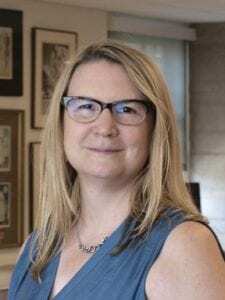 Her career as a medical information professional spans over two decades including positions at the Georgetown University Medical Center Library, Galter Health Sciences Library at Northwestern University, and the Hirsh Health Sciences Library at Tufts University. Stephanie was a 2015-16 NLM/AAHSL Leadership Fellow and is a member of the Medical Library Association and several of its standing committees including the Membership Committee and the Educational Media and Technologies Section. Stephanie’s relocation journey included a 7 day cross-country driving trip from Portland with her two cats. Stephanie enjoys cooking and baking, hiking, and running. She plans on training for another marathon…someday soon!